Wholesale Direct Synthetic Turf. Top Quality Turf. Best Artificial Grass in the Marketplace. Now Available at Village Nurseries Landscaping Centers. Looking for the most authentic looking synthetic turf on the market today? 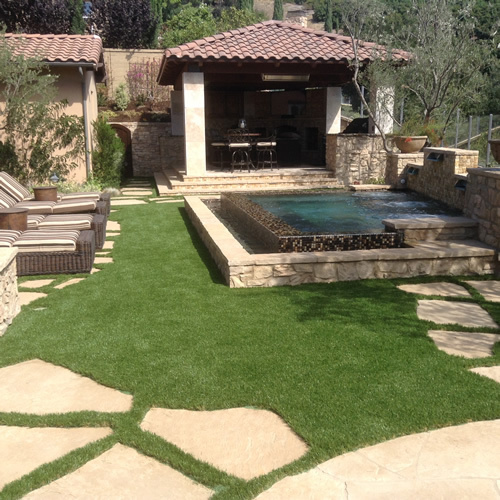 Professional’s Choice Synthetic Turf is the answer. Our turf is made using the most advanced synthetic fiber technology available. The result? The softest, most flexible and most realistic turf you can buy. During the manufacturing process a lighter colored fiber is woven into the turf to give it the natural thatch-look found in real grass. California is entering another year of little rainfall and the cost of water is skyrocketing. Synthetic turf allows you to have a ‘green lawn’ while eliminating the need for water, resulting in more money in your pocket! * Did you know that synthetic/artificial turf made off shore may contain heavy metals and is NOT recyclable? * Softest synthetic turf available making it Look So Real! An effective and efficient way to save money and water is to replace your water-guzzling lawn with synthetic turf or grass. Not only is it a hedge against rising water costs, synthetic turf also eliminates the need for fertilizer, weed retardant and other chemical applications associated with a healthy green lawn. And, by removing the upkeep of a lawn, including the expensive gardener, you will bank more spare time and money! A win-win all around.